Share this page on Twitter! The sleeve length on this product is generous. I typically have to buy “talls” in long sleeve tees and this top is just fine on me for sleeve length. Wow! I like this product! It’s like a “technical” long sleeve shirt, and although it’s sold as underwear, it looks great just worn as a shirt. 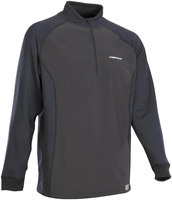 The inside material is a soft thin fleece that is super comfortable. There is enough stretch to allow freedom of motion for riding. The collar is taller than a regular tee, but for cold weather will be a comfort.